Big Looters Moving Money To South Africa, Morocco, Ghana? Acting chairman of the EFCC, Ibrahim Magu has claimed that those who plundered the wealth of the country have found safer havens in Morocco, Johannesburg and Ghana, where they are investing their loot in properties. According to him, looters have shifted base from Dubai, The United Arab Emirates (UAE). Magu said Dubai, hitherto, an attractive investment destination for looters, had lost its appeal following better anti-corruption cooperation between Nigeria, the UAE and several western countries. Magu spoke at a media parley at the commission’s Lagos Office yesterday. He said the Federal Government was mounting pressure on United Kingdom (UK) to extradite former Petroleum Minister Mrs. Diezani Alison-Madueke, so that she can face trial following the country’s failure to prosecute her over three years after it began investigating her for corruption. To him, since technology has made it easier to investigate financial crimes, the UK’s three-year investigation of Diezani is unacceptable. 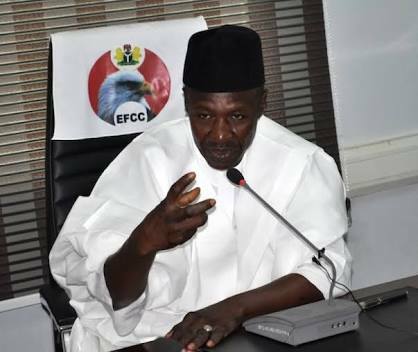 Magu said: “…in this era of digital banking, there is no aspect of financial crimes you will say the matter will go on for three and a half years. Gor three and a half years! One case! “So, I told my colleagues in the NCA (National Crime Agency) and CPS, Crown Prosecution Service (in the United Kingdom) that ‘No, it doesn’t make sense; if you cannot do it, give us, because we have gone to London and back, even America. “The Americans, Nigerians and the United Kingdom; we met in London, we met in Washington, we met here several times, so we have done a lot of things you cannot even imagine. “This Diezani case is everywhere. Any law enforcement agency that comes to Nigeria; even last time, the people investigating the Malabu case, they came, they just finished last Saturday and returned to their country. We had exchange of information. “So, the case has become very notorious, it has touched everywhere. You cannot investigate a matter endlessly; there are a lot of expectations; that’s why we said ‘give us if you cannot take action. Give us, we can take action.’ We are still insisting. EFCC is also on the case of “so many other politically exposed persons. “A lot of them are now buying properties in Morocco and we are monitoring them. They have stopped buying the ones in Dubai. They are busy hiding it, to sell the ones in Dubai. Magu vowed to, in collaboration with foreign anti-graft agencies, block inflows and outflows of illicit funds ahead of the 2019 polls. According to him, the EFCC is apolitical and would not take sides during the 2019 polls. He urged Nigerians to resist vote buying and pledged to prosecute money launderers.